Our new group website is online now at [ge.in.tum.de]. Please check it out for our latest resarch and updates! 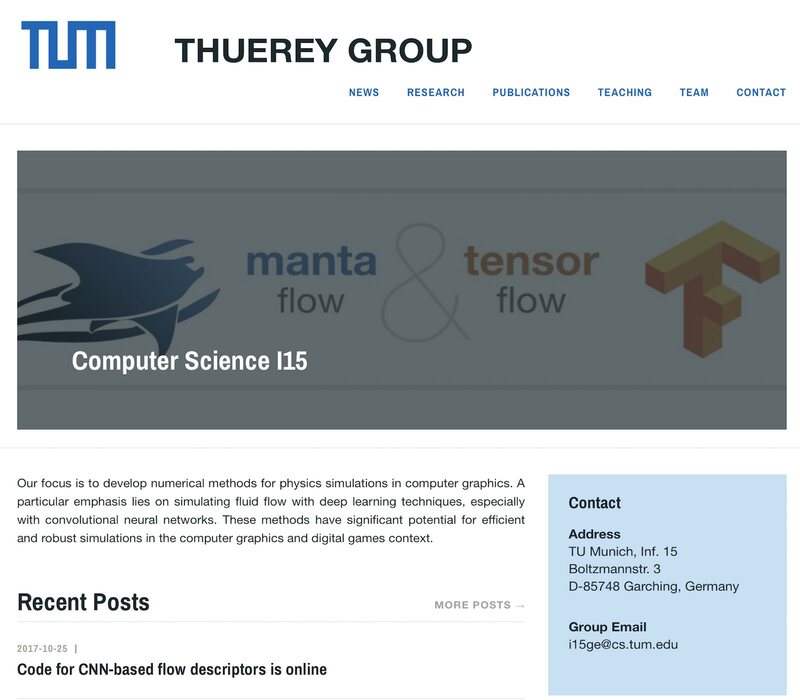 In particular, you can find info about our CNNs for physics simulations, and about our fluid solver [mantaflow] there. There are also tutorials on how to use it for training deep net's / CNNs with [tensorflow]. I am Assistant Professor at [TU Munich]. Before that I was at [ETH Zurich], and [ScanlineVFX]. My publications can be found [here], while this is my [CV], and these are some additional publication stats: , , . You can contact me at: "nils (dot) thuerey (at) tum.de". The focus of my research is to develop numerical methods for physics simulations in computer graphics. A particular emphasis lies on simulating fluid flow with deep learning algorithms. These methods have significant potential for efficient and robust simulations in the computer graphics and digital games context, but I am also very interested in applications from the fields of mechanical engineering and medicine.